In the Road Runner cartoons, Wily E Coyote often needed to buy various bits of equipment and products to try to stop said Road Runner. 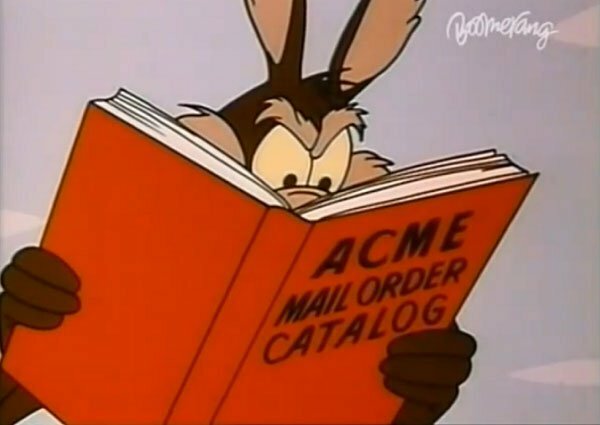 Invariably those anvils et al, were supplied by the Acme Corporation, a fictional company with a curious catalogue of products. It was always fun seeing what Acme was producing next. But we all knew it was a fictional company, and that was part of the gag. Now I know that films and television do a terrible job of representing things that nearly everyone viewing knows about on a day to day basis. People sat at computers don’t use the mouse or trackpad on film because that’s not as exciting as someone beavering away on a keyboard. When characters get sent text messages (at least until Sherlock changed all that), we saw curious screens with MASSIVE LETTERING that didn’t look any text messages or phones any of us had ever experienced. Newspaper headlines often, but not always, appear on fake newspapers. However, even when they appear on real ones, they are particularly expository in tone – clearly written by someone who’s never been near a newsroom and has no idea how to write a headline. But if there’s something today that annoys me more most, it’s the fake search engine. The drama you’re watching requires a character to do some research, perhaps look up another person. They naturally hit the internet. They open up a laptop (usually a real, branded laptop), and do an online search. On a fake website. They don’t use Google. They don’t even use Bing. Someone has had to create a fake search engine, that’s not already a real domain, and then make it look a little like Google, but not very much. It’s incredibly distracting for the audience, because the entire watching audience has used Google. So by not using Google, you’ve drawn our attention out of the story and into wondering why the character is using AcmeSearchEngine.com or whatever. Put it this way. The phone the character is using is probably an Apple or a Samsung. We know that because we can see the logo. If the producers made a fake handset and put, ooh, a “Banana” logo on it, we’d think they were going mad. So why do filmmakers use fake search engines? All products, logos, brand names and trademarks that are featured prominently in your film need to be cleared for use by the manufacturers or businesses concerned. It’s often worth getting someone you know/your art department to create fictional brands instead to avoid the hassle. If you do use real products find out who to talk to at the manufacturers via the press office. Some of the clearances can be done in pre-production, (if you have an art department they should have an idea of which products they want to use), but there will always be new products that come up on a daily basis. If the product, logo, brand name or trademark is non-distinctive in the background, you most likely (but not definitely) do not need permission to film it. For instance, if you are filming an exterior street scene and the BMW car logo happens to be in a showroom behind the action and no reference is made to BMW as a company, then you are likely not to need their permission. As a general rule though, you should avoid filming or referring to any product, logo, brand name and trademark that shows a company or its product in a detrimental way. This is essential as many companies that own the rights or trademark in brands, logos and names will have the money to pursue infringement actions against you, and may follow a strict policy of taking action against infringers to protect their brand. And there are obviously slightly different rules that apply in different countries. So the easy thing to do is not include any brands at all. But if you follow that through to its logical conclusion, no real brands would ever get used. Yet if a gang of villains in a drama use a black Range Rover to carry out an armed robbery, does Range Rover get to complain? Or if a character uses an iPhone to negotiate a drug deal, can Apple stop the production. Indeed if a character shoots an unarmed bystander at point blank range with a replica Glock, is that OK? There is branding to one extent or another on all of those, and in any case, the design is also trademarked. I realise that there’s a whole history of fake and real products on the internet. In Coronation Street, Rover’s Return regulars are famously fans of the fictional Newton & Ridley beer. Eastenders similarly has a fake brand. But in both soaps, the convenience stores tend to be stocked with real products, and while the camera doesn’t linger, nobody has blacked out the Kellogg’s logo as they might on Blue Peter build. Set against fake products, there is product placement, where brands pay for their products to be used in shot. In the UK, that’s regulated by Ofcom, and you’ll see a logo in programmes that use it. Serious dramas, as a rule, don’t tend to use it, although some soaps on commercial channesl do. In the US, the credits normally alert you to any product placement. Although if it’s done badly enough, you’ll know yourself. Music videos can be particularly egregious in this field. But there is another sort of “placement” – prop placement or prop provision. This is acceptable in the UK and elsewhere. Essentially there are middlemen who accept payment for supplying productions with props. If your production needs a bank of computers for a particular scene, then you phone up a prop provision company and they’ll help kit your set out for you. Need to borrow a luxury car for your lead character to drive but your budget won’t quite extend to hiring one? They may be able to supply one free. And it turns out that there is a whole industry that will also supply productions with fake websites. Thanks to Dave Walters for pointing me to Search-Wise.net, in fact a domain owned by a company called Compuhire, a company who specialise in in-vision graphics. So as well as fake search engines, the design fake graphics for computer screens, and ensure that those screens don’t cause flicker (for example with older CRT displays, the refresh rates of on-screen monitors need to be compatible with the number of frames per second your production is filming in to ensure that you don’t get strange banding effects on the screen). But it’s not just search engines that this fakery happens for. Consider the simple newspaper. You want your character reading a non-specific newspaper in a scene? Well Hollywood has got you covered. Indeed Slashfilm has a great piece detailing a single prop-newspaper that has been repeatedly used over the years in a vast range of productions – from Married with Children through to Modern Family. It’s clearly a copyright free and brand free paper. Slashfilm suggests it might be a playful gag from prop-handlers in a similar way to the inclusion of the Wilhelm Scream. But the real reason is that the papers are supplied by a Hollywood props company called Earl Hays Press, who specialise in printed props, and this is just a cheap standby standard. Note that in this instance, these are papers that aren’t used for close-ups. I know that it is possible to use brands without permission in productions. Consider, for example, The Social Network, about the founding of Facebook. That film was made without the permission of Facebook, and had to employ lots of trademarked material. Facebook founder, Mark Zuckerberg, was reported as not being happy at its production at the time. But I suspect in any case, that lawyers were heavily involved from the script stage onwards. See also the recent Danny Boyle/Aaron Sorkin film on Steve Jobs. Yet the entirely fictional film, dealing with an American trying to sell more Coca-Cola to Australians, undoubtedly includes many many references to copyrighted and trademarked products. The filmmakers had to be explicit in their unauthorised status, but the branding is there in the film throughout, and according to IMDB, the filmmakers still had to clear the film’s title with Coca-Cola, who one would assume, insisted on the disclaimer. And then there was the case of the indie film, Escape From Tomorrow, notable for having been shot almost entirely at Disney World without the permission the Disney company. At the time it was made, there was a belief that Disney might attempt to stop the film being distributed, but in the end they didn’t perhaps believing that the Streisand Effect might have given the film more press than leaving a small indie film alone might otherwise generate. However a good piece by Tim Wu at The New Yorker explains that the film is probably protected by US copyright law which allows for commentary and parody. In researching this piece, I did ask a lawyer friend of mine, why production companies were so careful at not including real brands. They told me that while many car brands, for example, won’t be cleared, it comes down to the three Rs – risk, reward and resource. Production teams have limited resource and will decide whether or not to seek approval based on the perceived risks in using that brand. How prominent will it be in the production, and who is the audience. The brand will find out that it’s been used one way or another, so will they pursue the production company at a later date? If the use of the brand is considered derogatory, damaging or inappropriate, then the production company can expect a cease and desist letter with intellectual property infringement claims. There are also other considerations including the launch of new products, or even rebrands that might be happening. Notably Google recently changed its logo, and it might prefer to keep its old brands from appearing in the media. I’ve no knowledge of whether Google is or isn’t especially litigious in this regard, but my friend did mention the recent comedy The Internship. I’ve not seen this film, but this Vince Vaughan alleged comedy scores a mighty 34% at Rotten Tomatoes. This film was clearly made with a great deal of assistance of Google. And because of that, it’s actually possible that Google is under an obligation to chase unauthorised use of its brand elsewhere because of financial considerations made elsewhere. This can be part of agreements for product placement too, with brands contractually obliged to protect their assets. So there you go. It seems like fake search engines, and fake social media networks for that matter, are likely to be here to stay. It seems a shame, because otherwise realistic portrayals are suddenly very fake in the viewer’s eyes, but producers usually prefer not to take a risk.